The Jackdaw – The end of Henry Moore in public? The end of Henry Moore in public? 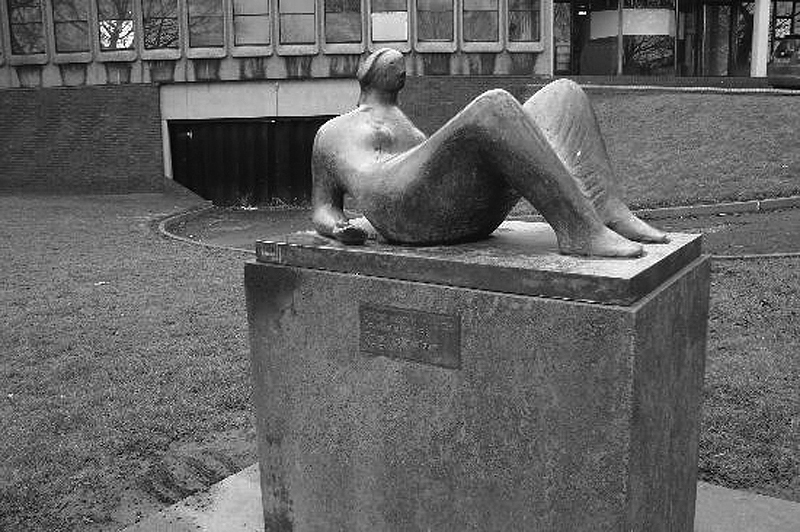 Henry Moore’s Reclining Figure (1952/3) has been removed from outside the civic centre in Castleford in order, it is claimed, to protect it from theft by scrap metal merchants. Erected in 1980 (in the sculptor’s home town no less), it is not known when or where the work will be returned to view – presumably when all the, er, charming, alternative scrap metal merchants have been packed off home to Limerick and Romania. Castleford’s does seem an over-reaction to the spate of sculpture pinching. All the other recent high profile thefts have taken place at secluded sites, graveyards, parks and country houses, not from the central square of a town whose inhabitants are milling about all night drinking and smoking their benefits away. Presumably the local councillors could instigate inexpensive measures to prevent its illegal removal. If Castleford is right on this there will soon be no Moores in any town. 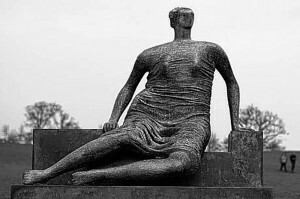 This figure, Dr aped Seated Woman of 1957/58, one of Henry Moore’s most eye-catching bronzes, is to be sold by Tower Hamlets council. (As readers of Private Eye will know, Tower Hamlets seems to be run as a sort of private fief by an Asian mafia.) The sculpture used to be sited on the green in the middle of a Stepney council estate, which was demolished. It has been on display at Yorkshire Sculpture Park since 1997 having been removed from the East End because it was attracting graffiti and other vandalism. The council, which is inevitably claiming chronic poverty, is hoping it will fetch £20 million. It couldn’t now be returned to so rundown a location for fear that it might be vandalized by culture-loving locals or stolen and melted down by our colourful friends in the itinerant community. Public art is a worthily altruistic idea but there are limits, and placing large sculptures made of bronze on council estates might be one of them. Make no mistake the dangers to sculpture are real. One of Moore’s important large bronzes has already been stolen and melted down. And in the case of the Harlow Family Group, a stone carving, this was decapitated and, following repair, had to be moved for its own safety from the site chosen for it by Moore to an indoor location where it can’t be seen properly. Any sale of Draped Seated Woman would be expressly against the spirit of Moore’s wishes. He was prepared to sell it to the council for £6,000 only if it was displayed in an underprivileged area – he was a working class lad himself. Opponents of the sale have alleged that the mayor only wishes to sell it in order to feed contracts to his business cronies. Doubtless their interest in culture rose to fevered excitement in February of this year when an equivalent piece by Moore was sold for £17 million. It has been proposed that the sculpture could be re-sited in Canary Wharf. Given Moore’s conditions, removal of the figure from a council estate to the home of global finance would surely too cynical a betrayal. The Jackdaw’s preference would be to see this impressive figure in the secure grounds close to the entrance of the British Museum. Visitors might then see it and within a few yards recognize its sculptural antecedents, the draped figures on the Parthenon frieze, which were such an inspiration to Moore. There are well over fifty works by Moore around the country on public sites, some of which are housing estates. In these straitened times, which can only get worse, local authorities may be tempted to see the wisdom of selling an asset which might realize sufficient cash to build a new school.